Complete all your required Judicial Council of California divorce forms online and follow the easy, step-by-step instructions. Get divorced without ever going to the courthouse. At least one spouse from the marriage must have lived in California for the last six months. "Irreconcilable Differences" is the grounds for divorce in nearly all California cases. If you do not want to continue your marriage and you want to end your marriage permanently, you have irreconcilable differences. File the documents with the court clerk. The judge completes your divorce by reviewing the agreement and signing the Judgment form. DivorceWriter guarantees that your California divorce documents will be accepted by the court or we will refund your purchase in full. 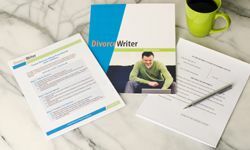 You have qualified to use DivorceWriter to complete your California divorce papers online. Select "Continue" to start the interview.